MANILA, Philippines (RELEASED) – The 'May 2018 Certified Public Accountant (CPA) board exam results' together with the list of passers, topnotchers (top 10), top performing schools and related announcements are available at this website as the Professional Regulation Commission (PRC) released the official results online on May 28, 2018 or five (5) working days after the last day of board exams. As announced, 2,843 out of 9,830 passed the exams. The schedule of online appointment for issuance of Professional ID and Certificate of Registration will start from June 4 to June 11, 2018. According to the Commission’s Resolution No. 2017-1068 entitled “Schedule of Licensure Examination for Year 2018”, the target release date of May 2018 CPA Board Exam result will be in four (4) working days after the last day of board examinations or by May 25, 2018 (Friday). Meanwhile, PRC Board of Accountancy are updating the examinees on the target/exact release date of CPA board exam results through its official social media page. We will also keep everyone posted through this website and our fan pages. Keep tuning in. On the same exams conducted by PRC on October 2017, results were released after ten (10) working days. On October 2016, results were out after eight (8) working days while during May 2017 and May 2016, results were released after five (5) working days. Accountancy is one of the programs with huge number of examinees being administered by PRC. On May 2017 CPA exams, 3,389 out of 9,645 (35.13%) examinees passed. Vianca Pearl Inot Amores and Marianato Jesus Berdin Del Rio, both from University of San Carlos ranked first in the exams having 92.67% rating. USC got the top spot in the top performing school's list having 66 out of 70 examinees passed or 94.29% overall passing rate followed by De La Salle University - Manila having 79 out of 92 examinees passed or 85.87% rating. During October 2016 CPA exams, 5,249 out of 14,390 (36.48%) examinees passed. UP ranked first in the top performing school list having all of its 69 examinees passed or 100% overall passing rate. Vhinson Jay Samson Garcia from Wesleyan University Philippines - Cabanatuan City got the top spot garnering 94.33% rating followed by Daryl John Sarmiento Punzalan from Southern Luzon State University - Lucban having 94.17%. On May 2016 CPA board exam, 2,967 out of 6,925 (42.84%) examinees passed. De La Salle University ranked first in the top performing schools having 54 out of 58 examinees passed or 93.10% overall rating followed by UST having 84 out 93 passers or 90.32% and University of San Jose Recoletos having 108 out of 133 board passers or 81.20%. Karim Gonzales Abitago from Universal Colleges of Paranaque topped the exams garnering 92.17% rating. He was followed by Kimjames Sarapanan Manalo from Cor Jesu College having 91.83% and Jayvee Faust Bugtai Anga from University of San Jose Recoletos having 91.67%. 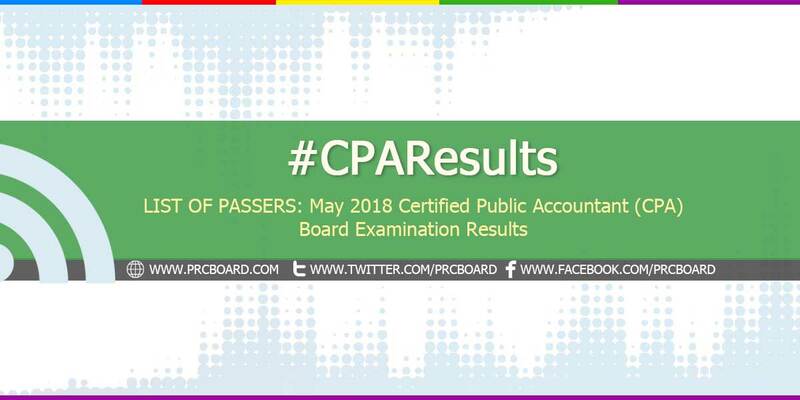 To receive up-to-date news on full results of May 2018 CPA board exam result, we advise our visitors to bookmark this page, visit PRC official website or follow us at our social media pages via Facebook and Twitter. Tagal ng result baka next week pa to. May result na ba mamaya? i'm nervous for this....pray hard candidates! wala pa po ba result? Younger sis.. Hope u made it..
WALA PA BA??? SOBRANG TAGAL GRABE!!!!!! bes, akin ka na lang pls. Di kita iiwan. Praying for my Babe! :) <3 Advance Congratulations babe! Proud boyfie here..
waiting for my girl to have 3 letters in her last name. CPA! Iloveyou Fave! Praying for my officemate! Gogogogo! Hoping that my sister in Christ will pass the exam, but whatever will be the results I believe God has a best plan to all of the examiners. God bless all of you. Sana mag adjust PRC for more Passers! God bless us all! what time po ba talaga ang result? marami ng nakataya..
Sa kanya nga limang taon akong naghintay sa wala, kinaya ko. Sa resulta pa ba nito ako maiinip? the prc site is down. how do we register online?